Lighting contractors say lighting represents up to 37% of a typical warehouse’s monthly electricity consumption expense. A properly designed and executed LED high bay lighting retrofit can reduce energy usage by up to 60% – making a significant difference in a company’s bottom line. LED high bay lighting fixtures, common in warehouses, last up to three times longer than metal halide or T8 fluorescent lighting systems and up to 60 times longer than incandescent lighting sources. 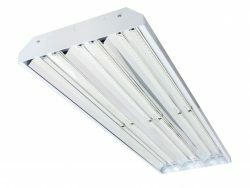 Typically, companies will swap metal halide and fluorescent overhead lighting for the more efficient LED technology, replacing 400-Watt HID fixtures, six-lamp T5HOs or 8 Lamp T8 fluorescent fixtures with LED High Bays, which are manufactured by Phillips, DiaLight, Peerless Bruno and most recently by Wholesale Contractor’s Supply. LED High Bay Lighting by Phillips – Phillip’s Day-Brite series touts a 40% lower power consumption rate. The FBX LED High Bay is a compact and economical luminaire utilizing the latest in LED technology. With several lumen packages and optical distribution patterns available, the FBX promises exceptional lighting in mid to high ceiling applications. For maximum versatility, the FBX features seven lumen packages with efficacies up to 115 LPW, five optical configurations, and three lens options. Its modular design provides the flexibility of different outputs and multiple distributions, all from the same basic luminaire construction, allowing buyers to choose the right solution for each space within an application, while maintaining fixture continuity. This comprehensive LED high bay lighting family is ideal for illuminating warehouses, industrial areas, big box retail settings, along with many other applications. A variety of mounting options are available, including chain, pendant, and cable. Dimming drivers are standard, and motion detectors are optional to give complete control over energy savings. Wire guards are also available. LED High Bay Lighting by Dialight – Last spring the company announced the launch of its new End-to-End Linear series touting the most durable and salt-resistant LED high bay lighting solution on the market to replace conventional HID and fluorescent fixtures in a wide range of industrial applications, from petrochemical and heavy industrial manufacturing to food production with Dialight’s first NSF-certified LED lighting product. Featuring a fully gasketed enclosure made from an extruded 6063 aluminum housing, the End-to-End linear series, which allows wiring on each end of the fixture, offers the most ruggedized housing for long life durability against water, salt, dust and vibration. The IP66/67-rated fixture ensures resistance to dust and water ingress with the added assurance of UL1598/A rating that guarantees excellent corrosion resistance in marine and offshore environments. Sealed, integrated wiring compartments on each end provide easy access for installation in low-profile applications and through-wiring capability supports multiple fixture installation on a universal 120-277V AC circuit. LED High Bay Lighting by Peerless Bruno – The company’s LED high bay lighting Softshine series is available in distributions from 70% up/30% down to 100% down. Bruno LED Softshine is specifiable with high and low lumen packages that make the luminaire well-suited for a variety of applications. 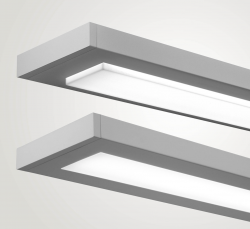 Bruno LED can be specified as nLight®-enabled to provide network controls connectivity, energy-saving digital lumen management or both. It is also available with an integrated sensor for daylight dimming and/or occupancy detection control. Plus, Bruno LED high bay lighting can be configured with X, T, L or straight connectors to form creative suspension arrangements. Bruno LED high bay lighting features eldoLED® drivers that fully dim to black with no flicker as part of a modular light engine that delivers 50,000 hours (12-15 years) of illumination to L80. LED High Bay Lighting by Wholesale Contractor Supply – Perhaps the best value in LED high bay lighting, from a cost benefit analysis standpoint, are new offerings from WCS. 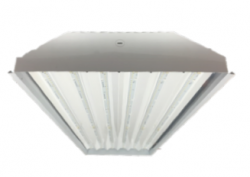 WCS offers an LED High Bay 400-Watt HID equivalent High Bay light in a four-foot section at 5000k. This LED high bay lighting fixture replaces a 400-Watt HID fixture, six-lamp T5HO or eight-lamp T8 fixture. WCS also offers an LED High Bay four-foot, 5000k that replaces an 8-lamp T8 or 6-lamp T5HO light. LED High Bay Lighting by MaxLites – Another popular line is the MaxLites BayMax™ LED Linear High Bay Fixture with optional bi-level controls. 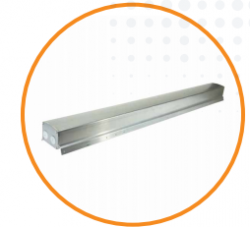 This fixture offers a classic fluorescent linear high bay housing with LM80-tested LED strips that resemble fluorescent tubes when lit. 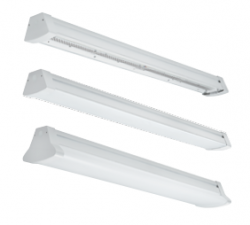 The same size and shape as a T8 fluorescent fixture, and improved with exceptional 100+ LPW output, the 115-watt performance- and value-optimized fixture replaces a 250-watt fluorescent high bay, while the 150W& 235W models are 400W HID equivalent fixture, All fit standard fluorescent accessories. The fixtures are constructed of sheet steel for heat sink and thermal control and a specular reflector for higher lumens. WCS works with leading manufacturers to provide a diverse product line of more than 45,000 items featuring top brands in the industry at competitive prices. WCS LED High Bay lighting fixtures feature a range of LED engines, 5000k color, multiple lumens options and are configurable with multiple systems.